Type: Mini Straight Knife. Blade Length: 5.2CM. Blade Material: 5Cr15Mov. Size: 14CM 5.2CM. Each one is bought from an authorized master distributor located in Virginia. 4.5" closed. 3.5" satin finish 5Cr13MoV stainless tanto blade. Black GRN(glass reinforced nylon) handle. Thumb stud. Pocket clip. How will you receive your knife?. The knife in the picture is the exact knife you will receive unless otherwise stated. So look close. What's the length with largest blade open?. GOOD, NORMAL WEAR. Does it lock tight?. Blade is partially serrated and it features a linerlock as opposed to the arc lock of the newer ones. Appears unused with light staining on blade. Rare tang stamping, as an early version it has AUS-8A blade. The SOG Twitch II is a sleek spring assisted knife that utilizes the SOG Assisted Technology (S.A.T.). This Twitch II has tactical finished hard anodized aluminum handles with a tip-up pocket clip. The AUS 8 stainless steel blade has a plain edge and a TiNi finish. Forged out of tradition, hardened in the field, honed for you. We have a saying that the best knife is the one that you have with you! Always be prepared with the new Key knife. This is the first lockback of its kind. Force Black TiNi Fixed Plain Blade Knife With Nylon Sheath. Blade Finish: Black TiNi. Blade Length: 6" x. 236". Handle: Glass Reinforced Nylon. Steel: AUS 8 Stainless. Condition: NEW. Overall Length: 11.25". 4.75"" closed. 3.5"" satin finish VG-10 stainless drop point blade. Black textured GRN handle. Lanyard hole. Pocket clip. Thumb stud. Extended tang. We Provide Free Local Pick Up on all orders. Closed: 4.75"; Blade: 3.5", VG-10 Stainless, Standard Edge, Satin Finish; Handle: Black; Other Info: Lanyard Hole, Pocket Clip, Thumb Stud(s), Thumb Ridge. Tanto blade. We Provide Free Local Pick Up on all orders. SKU: SOGVL01. 4.75"" closed. 3.5"" satin finish VG-10 stainless drop point blade. Black textured GRN handle. Lanyard hole. Pocket clip. Thumb stud. Extended tang. We also have this knife in #1 orange handle ,#2 black handle ,#3 green handle. Lock type: back lock (Built-in safety switch). Blade length: 68mm/2.70". Blade width: 27mm/0.85". Blade thickness: 2.5mm. San Mai III Vulcan Tanto Folder - Plain Edge. Steel: San Mai III (VG-10 Core. Our Vulcan is also formidable with a powerful strength of construction. There is nothing weak about the Vulcan. Take for instance our patented Arc-Lock. ). SOG Salut eBead Blasted Folder - Plain Edge. Take the machined G10 handles in combination with scalloped full-length steel liners for a whole new look. Add a big lockback, smooth as silk operation, and a proven Bowie style blade. Blade: 1.75". this is an used item. fully open: 4.5". Looking at the intricate construction of the Twitches reminds us of the workings in a fine chronograph watch.everything right and precisely in its place. These techno wizards feature a pass-through lockbar from which the "kick" of the blade sticks through. Blade Finish: Satin. Blade Length: 3.5" x. 125". Handle: Glass Reinforced Nylon. Steel: AUS 8 Stainless. Model #: FSAT8-CP. Our Award-Winning Mini Vulcan is also formidable with a powerful strength of construction. There is nothing weak about the Mini Vulcan. Take for instance our patented Arc-Lock. Mini Vulcan Folder - Plain Edge. SKU: SOGVL03. Closed: 4.75"; Blade: 3.5", VG-10 Stainless, Standard Edge, Satin Finish; Handle: Black; Other Info: Lanyard Hole, Pocket Clip, Thumb Stud(s), Thumb Ridge. Tanto blade. New SOG SOGVL03 Vulcan Tanto Closed: 4.75"; Blade: 3.5", VG-10 Stainless, Standard Edge, Satin Finish; Handle: Black; Other Info: Lanyard Hole, Pocket Clip, Thumb Stud(s), Thumb Ridge. Tanto blade. The Flash II has got to be one of the coolest knives we’ve ever seen. Forget its wicked-quick blade access, that it handles like a race car on rails, or that it locks up like Alcatraz. It just looks and feels extraordinary. The Flash II Tanto has got to be one of the coolest knives we've ever seen. Forget its wicked-quick blade access, that it handles like a race car on rails, or that it locks up like Alcatraz. It just looks and feels extraordinary. Blade Length: 3.4" x. 13". Blade Finish: Bead Blasted. Handle: 6061-T6 Anodized Aluminum w/ Polycarbonate Cover. Steel: 8Cr13MoV Stainless. Weight: 4.8 oz. Thumb Stud. Blade Length: 3.75". Blade Thickness: 0.13". Blade Material: AUS-8. Handle Material: Black FRN. Handle Length: 4.75". Cutting Edge: 3.50". Plain Edge. 3" black TiNi. 4" closed Plunge Lock. 3" black TiNi finish F.A.S.T. assisted opening AUS-8 stainless tanto blade with dual thumb studs. Black aluminum handles with safety lock. Lanyard hole. Reversible black finish stainless pocket clip. The Flash family of knives feature SOG Assisted Technology (S.A.T. ), which employs a powerful piston lock that is easily released with a sliding button. - Blade Steel Type: Aus-8. - Finish: Satin. We may utilize signature required. New SOG SOGVL01 Vulcan Arc Lock 4.75"" closed. 3.5"" satin finish VG-10 stainless drop point blade. Black textured GRN handle. Lanyard hole. Pocket clip. Thumb stud. Extended tang. SOG Vulcan Folder Folding Knife VL-01. 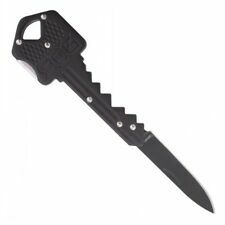 Type: Assisted Opening; Closed: 4.625"; Blade: 3.375" l AUS-8 Stainless l Standard Edge l Satin Finish; Handle: Black l GRN; Other Info: A/O l Thumb Stud(s) l Pocket Clip l Lanyard Hole. Side lock. Drop point blade. SKU: SOGGB1001CP. Overall: 7.25"; Blade: 2.5" l 7Cr17MoV Stainless l Standard Edge l Satin Finish; Handle: Black l GRN; Other Info: Full Tang. Hard nylon sheath with 360 degree rotating clip. It is an 2.5" pocket knife with an 2" blade, it is totally colored in black. this is a nice used item. Forged out of tradition, hardened in the field, honed for you. ABOUT SOG SPECIALTY KNIVES & TOOLS Utilizing SOG's patented assisted opening technology, the blade opens quickly with a simple push of your thumb. SOG Visionary I Folder - Plain Edge. People with big and small hands will find the Visionary I a pleasure to hold and carry. It has a finely textured GRN handle that is both lightweight and ergonomic. 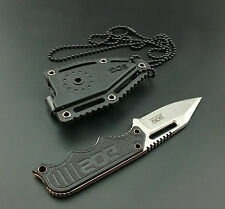 Aegis Tanto Folder Black TiNi Coated - Serrated Edge. Blade Finish: Black TiNi. Start to open the knife, and let Aegis finish the action with a bang, using one of the surest assisted technologies (S.A.T.) out there! Made in Japan, this Vulcan Mini Lock Blade pocket knife is made of San Mai VG-10 Stainless Steel and Black Glass-reinforced Nylon Synthetic Handle. This Vulcan Series SOG Specialty Knives SOG VL-04 FOLDING VULCAN TANTO is 4 1/4 inches. 729857991261. New SOG SOGFSA8BX Flash II A/O Satin Drop Point Type: Assisted Opening; Closed: 4.625"; Blade: 3.375" l AUS-8 Stainless l Standard Edge l Satin Finish; Handle: Black l GRN; Other Info: A/O l Thumb Stud(s) l Pocket Clip l Lanyard Hole. 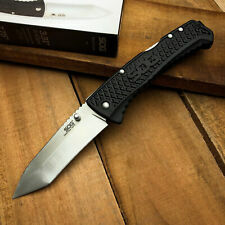 NIB SOG Zoom Mini Tanto Black Tini A/O SOG00063 4" closed Plunge Lock. SKU: SOG00063. MPN: SOG00063. 4" closed Plunge Lock. 3" black TiNi finish F.A.S.T. assisted opening AUS-8 stainless tanto blade with dual thumb studs. Black aluminum handles with safety lock. Lanyard hole. It combines our high performance piston lock but with the addition of a kick start device. SOG Toothlock Folder - Serrated Edge. You will find it stimulating. The blade shape is novel as well with a wavy reverse curve that cuts effortlessly while maintaining a thick reinforced tip for power penetration. Made in Taiwan, this Locking Folding Hunter pocket knife is made of AUS-8 Stainless Steel and Black Glass-reinforced Nylon Handle. This SOG Specialty Knives SOG TF2-CP FOLDING TRIDENT CLAM is 4 3/4 inches. 729857994477. Our Vulcan is also formidable with a powerful strength of construction. There is nothing weak about the Vulcan. Take for instance our patented Arc-Lock. Vulcan Folder - Plain Edge. The General Electric M61A1 Vulcan is a 6-barrel 20mm cannon of the gatling-type. Made in Taiwan, this Flash 2 pocket knife is made of AUS-8 Stainless Steel and Black Glass-reinforced Nylon Synthetic Handle. 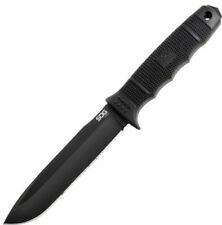 This SOG Specialty Knives SOG FSA8-BX FOLDING FLASH II is 4 5/8 inches. 729857003650. Hard nylon sheath with 360 degree rotating clip. Ending soon. Buy it now. Why buy from us. Orders must be Prepaid before Pickup. We Provide Free Local Pick Up on all orders. Red & Green Dot Optics. Pistol Cases. New SOG 4" closed Plunge Lock. 3" black TiNi finish F.A.S.T. assisted opening AUS-8 stainless tanto blade with dual thumb studs. Black aluminum handles with safety lock. Lanyard hole. Reversible black finish stainless pocket clip. SKU: SOGFSA8BX. Type: Assisted Opening; Closed: 4.625"; Blade: 3.375" l AUS-8 Stainless l Standard Edge l Satin Finish; Handle: Black l GRN; Other Info: A/O l Thumb Stud(s) l Pocket Clip l Lanyard Hole. Made in Japan, this Locking Folding Hunter pocket knife is made of VG-10 Stainless Steel and Black Glass-reinforced Nylon Handle. This SOG Specialty Knives SOG PE15-BX FOLDING PENT ARC is 5 inches. 729857006453. Made in Taiwan, this Flash 2 pocket knife is made of AUS-8 Stainless Steel and Black Glass-reinforced Nylon Synthetic Handle. This SOG Specialty Knives SOG TFSA98-BX FOLDING FLASH II is 4 5/8 inches. 729857003674.